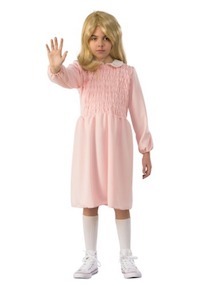 The officially licensed dress is made to be a replica dress which recreates Eleven’s iconic look from season 1 of Netflix’s popular show, Stranger Things. The knee-length dress is a beautiful baby-pink color which invokes a youthful appearance perfect for little girls. The costume dress features ruching in the bodice, elastic around the sleeve cuffs, and a white scalloped collar for a fitted look. It’s a perfect replica of El’s now-iconic pink dress from Season 1, including the white Peter Pan collar and front smocking. You’ll either want to sport a wig or, you know, shave your head to make this look authentic (We’re all in favor of going all-out for authenticity, but really think that move through, first. 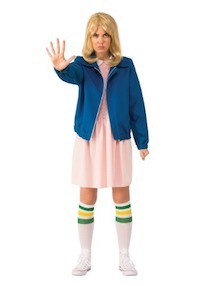 Click here to get the Stranger Things Eleven Pink Dress Costume for Women. This costume look features a pink collared dress that secures in the back. 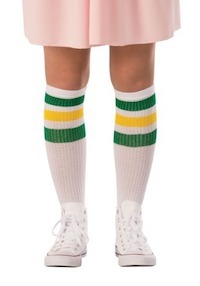 Athletic striped tube socks are included for a little retro style, and if you want to complete the costume effect, you’re just going to need the Strange Girl wig (sold separately). Eleven’s pair of 80s style knee-high socks from Stranger Things was an important component. Don’t forget these. Click here to get Stranger Things Eleven Socks. You’ve already got the baby-pink dress with the Peter Pan collar; you’ve got the knee socks, the sneakers, and even the blonde wig. And you look positively Eleven-esque. But in order to completely nail your costume, you need this blue lightweight jacket to go on top! It has a front zipper and will look best for your role with a bit of dirt n’ grime on it. This jacket will help keep you warm as you head out to that Halloween party, and proves clutch in crafting an authentic version of Eleven’s signature Season 1 look! 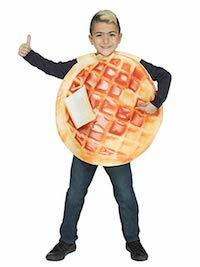 You and someone else can dress up as a Waffle. This will be a great partner costume. This kit is almost as handy as Steve’s trusty nail bat, but a lot easier to wield! It includes everything you need to give yourself a bloody nose (proof of your powers) and also includes a “011” temporary tattoo, just like El’s! After being adopted by Hopper, all she eats is waffles. The fridge is full of waffles for Eleven to eat. 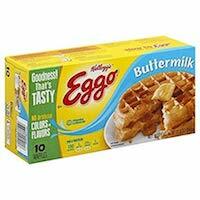 You must walk around with a box of waffles if you want to look like El. Click here to get Stranger Things Eleven loves waffles.